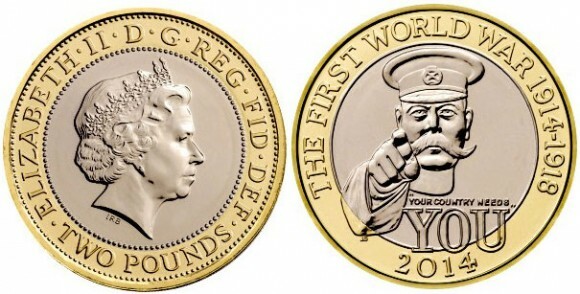 Lord Kitchener on the £2 Coin. Right or Wrong? Removing Kitchener in preference to a design honouring peace would be a strange decision at this time. It is worth remembering the coin is one of five to be created in the period 2014 – 2018. It is hard to think of a more appropriate design to remember the events of one hundred years ago than this iconic image. Kitchener’s links to our colonial nineteenth century past are undeniable. However, it is not those events the coin is recognising. Neither is it celebrating the man himself, even though he did much to raise an army and organise sufficient munitions to prosecute the war effort. The design is a clear symbol of 1914 and the beginning of the war. I am sure that by 2018 the calls to have a design denoting peace will be strong but that time is not now. The poster, one of the most iconic of the twentieth century, symbolises the Call to Arms in which men enlisted in the hundreds of thousands into what became the ‘New Army’ or ‘Kitchener’s Army’. That those men went off to various theatres of war to fight is undeniable; inevitably a proportion were killed or wounded in action. However, that is the reality of fighting a modern industrial war. It is a bloody, vicious, all encompassing process which the entire country is part of. As such, large scale casualties are inevitable. Men’s enthusiasm to enlist (for a myriad of reasons and not simply patriotism) and duty ensured the British, for so long reliant on the Royal Navy, could form an army of sufficient size to fight the Germans in continental Europe. 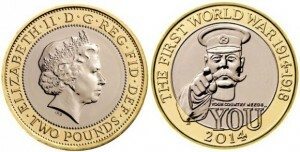 I have read suggestions that an image of Harry Patch be used on the coin as an alternative. Harry was the ‘Last Fighting Tommy’ and won a place in the hearts of many around the world due to his passionate advocacy for peace. I was lucky enough to know him well, looking after him on his pilgrimages back to Flanders. However, whilst he was the last survivor of the trenches, the question remains, was he symbolic of the way that all old soldiers thought? Not at all. As hard as it may be for us to stomach, many of those who went to war enjoyed it, revelling in the experience; the camaraderie, regular food, exercise and the chance to escape their humdrum or dangerous industrial civilian life. These men would never live their life in the same way, never living on the edge again. It would be wrong to say that all soldiers thought like this but, neither did all men who fought share Harry’s views. With millions of service personnel it is inevitable there were many different views. So, would it be a good idea to have Harry on a coin? Only if his views mirror those of every serviceman and woman who did ‘their bit’. Clearly, they do not. What we are talking about here is a coin – one of five to be created over the next five years. Does it remind me of ‘jingoism’ and the dark days of British colonial expansion? No. It brings to mind 1914 and the mass enlistment of a new army. The irony is that in many ways I am ambivalent to it. It is a coin, that is all. I doubt many could say what image adorns the loose change rattling in their pockets or purses. However, unless a brilliant new design is pushed through that strikes a particular chord then I’ll be happy to go with Lord K and his Call to Arms. If I ever get to see one in my change then my first reaction will probably be to think of that wasted morning I spent talking and writing about it. Which brings me on neatly to my next point…. Like many who spend their life researching and learning about the First World War, either guiding on the battlefields, researching in archives or speaking to schoolchildren I am increasingly disheartened by the events of the first week of 2014 which has seen an ugly war of words between various political parties. I am not alone in finding these arguments, started by Michael Gove in his Daily Mail article, unedifying. Clearly, the centenary offers a perfect opportunity for political parties of every persuasion to have their say on upcoming events, using it for their own political benefit. Making cheap political capital out of this period is opportunistic but, sadly, unsurprising. With the social and economic injustices in this country haven’t we more pressing issues in this country for politicians to deal with? For many of us with a deep-seated and long-standing interest in the war the focus will remain the men who served, their families who remained at home and that legacy – that is what is important, not political jousting and ‘what if’ history. It is sad to say but after just ten days of the new calendar year I am already looking forward to 2018 and the lessening of media and political interest. At this rate, it cannot come too soon. The discussion on the Steve Le Fevre BBC Radio Bristol Breakfast Show can be heard via iPlayer for another seven days HERE. The piece starts from 1:49.20 in.